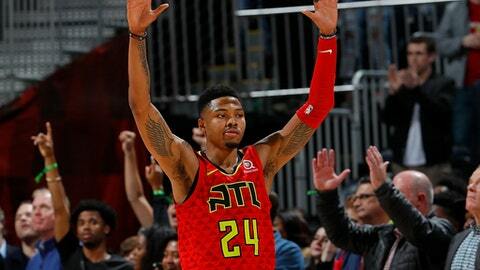 ATLANTA (AP) Kent Bazemore’s favorite play, a chase-down blocked shot, was even sweeter when the defensive gem followed his biggest shot of the game. ”By far my favorite play in the game of basketball is the chase-down block,” Bazemore said. ”He fuels our team with great competitive spirit and great competitive energy,” Hawks coach Mike Budenholzer said. A layup by Taj Gibson cut Atlanta’s lead to 101-100. Following a missed short jumper by Dennis Schroder, Minnesota called timeout with 14.5 seconds remaining. Unable to make the inbounds pass, Teague was whistled for a five-second violation before trying to call a timeout. The Hawks began the night with the NBA’s worst record but have won six straight home games against teams from the Western Conference. Timberwolves: Began the night one game behind San Antonio for the No. 3 seed in the Western Conference. … Minnesota fell to 1-7 on the road in January. .. Gibson scored 17 points and Karl-Anthony Towns had 15 points and 13 rebounds. … Teague shot only 1 of 12 from the field for two points with 10 assists. Hawks: Had a 46-24 advantage in bench points. … Dewayne Dedmon, the 7-foot backup center, sank both of his 3-point attempts in the first half – one shy of his career high for a game. Dedmon had 10 points. Ersan Ilyasova also scored 10. … The Hawks had a 44-35 advantage in rebounds, including 11 by rookie John Collins. … Schroder had 11 assists for a double-double. With the game tied at 90, Teague and Gibson each were called for a technical foul by official Lauren Holtkamp following Teague’s offensive foul. Schroder made only one of two free throws. Budenholzer was surprised when told before the game of his team’s streak at home against Western Conference opponents.